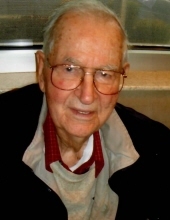 Robinson, Joseph E., 99, suddenly on January 26, 2019. A lifelong resident of Absecon, he graduated from Pleasantville High School in 1939, at the top of his class. He was an all-round athlete and scholar. He served in the US Army from 1940-45 obtaining the rank of Staff Sergeant in the European Theater of Operations and was awarded two Bronze Stars. He married his high school sweetheart, Annette Starr McCutchen, in 1942 and the couple had two children. Joe was a socially active man who was deeply involved in the Church and the community for the majority of his life. His family and friends will always remember him as an intelligent, dedicated, strong, and loyal family man. After the war, he worked for the Bell Atlantic Telephone Co., retiring in 1981. He then worked at Glenn Insurance Co. through 2010. During the 1960’s, Joe was President of the Absecon Historical Society, Chair of the United Methodist Church Finance Committee and member of the Kiwanis Club. Joe was an avid reader and especially enjoyed Shakespeare, a world traveler (his favorite cities were Paris and London), a sports enthusiast, devout Christian, and prodigious gardener and chess player. He loved attending the theater and orchestra, was an audio and video geek and frequently used his computers and the Internet. He is preceded in death by his beloved wife Annette (1920-1972) and his second wife Cyrene (1923-2009). He is survived by his two daughters, Kathleen Pinto (Tom) and Joanne Schimpf (John), two granddaughters, Carly Reynolds and Lindsay Savage, and five great-grandchildren. A funeral service is scheduled for 3 pm, a gathering of friends at 2 pm, Saturday, February 2, 2019 at The United Methodist Church of Absecon, 100 Pitney Road, with burial to follow at the Church Cemetery. All are welcome to attend and celebrate Joseph’s life. In lieu of flowers, please send donations to the Absecon Methodist Church in his name. For directions and online condolences, please visit www.parselsfh.com. To send flowers or a remembrance gift to the family of Joseph E. Robinson, please visit our Tribute Store. "Email Address" would like to share the life celebration of Joseph E. Robinson. Click on the "link" to go to share a favorite memory or leave a condolence message for the family.